DeAndre Yedlin (left) of United States and Alberto Quintero of Panama fight for the ball during the 2018 FIFA World Cup Qualifying match Friday in Orlando, Fla.
Countries are grouped into six qualifying regions. 209 nations are vying for just 32 spots. A total of 831 matches are played to determine who makes the World Cup. The United States has played nine qualifying matches (three wins, three losses and three draws). But it all comes down to tonight: on the road against Trinidad and Tobago. "This is what all players want," said defender DaMarcus Beasley, "a chance to qualify for the World Cup. But the game that actually does it." It's a match the U.S. should win (on paper, at least). Against the Soca Warriors, the U.S. has an 18-2-4 all-time record, including 13 victories against Trinidad and Tobago in World Cup qualifiers. But this one might be different. Trinidad and Tobago has no chance to make the World Cup. "We expect a tough game," said defender Matt Besler. "Sometimes that can be even more difficult when you play a team like that with nothing to lose. We know they're going to go out and play relaxed," Besler said, "If we play our best, we know that should be good enough to qualify us for the World Cup." That's the hope of U.S. head coach Bruce Arena: "I think we're in a pretty good position ... unless something bizarre occurs. Our mentality is to go to Trinidad and win." The U.S. has played with renewed enthusiasm since Arena returned as head coach. The squad has been sparked by the stellar play of forward Jozy Altidore and young phenom Christian Pulisic. The 19-year-old midfielder has scored scored or assisted in 11 of the 16 U.S. goals in the final round of World Cup qualifying. Field conditions may be an issue tonight. The game was moved from the Trinidadian capital of Port of Spain to a smaller stadium in Couva. When the U.S. team arrived for its practice session on Monday, the players found conditions a bit soggy. 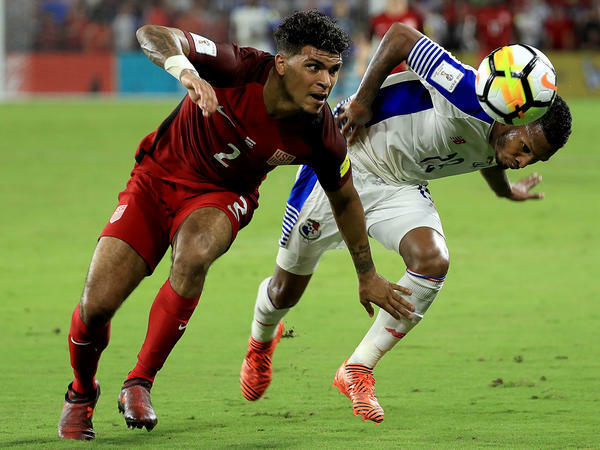 The U.S. ties Trinidad and Tobago -AND- Honduras and Panama do not make up the goal difference in wins vs. Mexico and Costa Rica respectively. The U.S. loses at Trinidad and Tobago -AND- Honduras and Panama both draw/lose vs. Mexico and Costa Rica respectively. Among the teams in so far: Germany (defending champion), Brazil, Belgium, England, Mexico, Costa Rica, Spain, and, as host, Russia qualifies automatically. For the U.S., the simplest way to add its name as a World Cup qualifier (for the eighth straight tournament) is to win tonight. Coverage begins at 8 p.m., ET, on beIN Sport and UNIVERSO.